Hypoplastic right heart syndrome (HRHS) refers to underdevelopment of the right sided structures of the heart. These defects cause inadequate blood flow to the lungs and thus, a blue or cyanotic infant. The major problem is pulmonary valve atresia (absence). This valve normally opens and closes to let blood flow to the pulmonary artery. Secondary problems include a very small (hypoplastic) right ventricle (lower chamber which normally pumps blood to the lungs); a small tricuspid valve (this valve allows blood to flow into the right ventricle) and a small (hypoplastic) pulmonary artery. Also, the blood flow into the coronary arteries may be abnormal causing damage to the heart muscle. The infant is born with two connections that help blood flow. These are a foramen ovale (hole between the atria) and patent ductus arteriosus (or PDA, a blood vessel between the aorta and pulmonary artery). 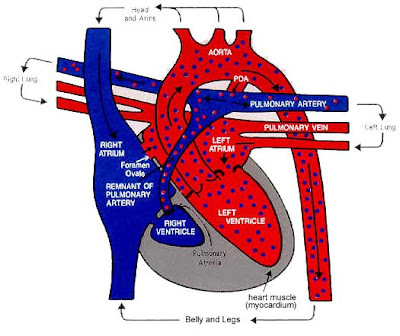 As these connections begin to close, the infant becomes critically ill.
Because the blue blood cannot pass through the right side of the heart to get to the lungs, it crosses into the left atrium and mixes with red blood returning from the lungs. This mixed blood is pumped out of the aorta. The only way in which blood gets to the lungs is through the PDA. The PDA must be maintained open with medicine (PGE1). Surgery is usually performed shortly after starting PGE1 to create an artificial connection (shunt) between the aorta and the pulmonary artery to deliver blood to the lungs.